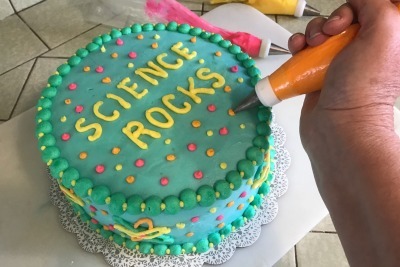 When planning a Science Birthday Party try making a spectacular, colorful Polka Dot Cake. Follow these instructions and you can do it! I wasn’t sure what I had it mind but I did a bit of internet scouting and fell upon the most vibrant and fun cake. With a few alterations..(more color!!) it was just what I was looking for. 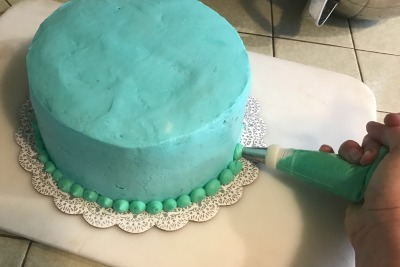 Thanks to Deborah, from Once Upon A Pedestal for this crazy polka dot cake idea. She used cake pop pans, but I used cookie cutters. I used cake mixes for the cake but you can make from scratch with this 8′ layer cake recipe from Martha Stewart. 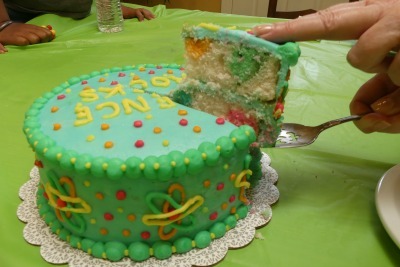 The Polk Dot Party Cake will make your Science Birthday Party extra special. If you want to add some fun experiments to the proceedings then check out our Bottle Bubbler experiment! Bake as directed in the recipe. A toothpick inserted into the center should come out clean. Let cool for 10 minutes and remove from the pans. Cool on a wire rack. Cut out circles from each cake with a 1-inch round cookie cutter. Use leftover cake to make cake pops. Not shown here. Prepare the second cake mix as directed on the package. 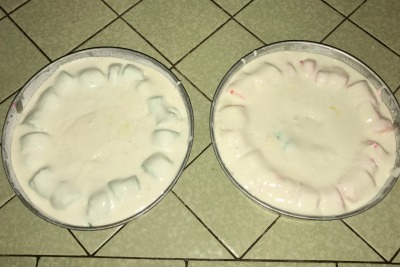 Divide the batter evenly among two, greased and flour dusted 9-inch round cake pans. 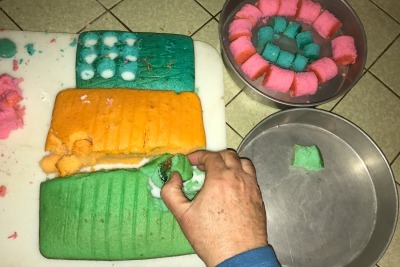 Lay the assorted colored cake circles into each pan. 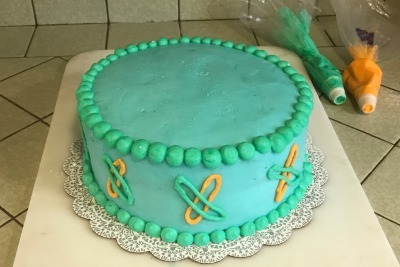 The circles should lay on their sides so that when you cut the cake they will be round. Pour the second batch of cake batter over the already cooked cake circles. (Yes, it really works.) The cake circles will be visible. Bake according to your recipe’s instructions or until a toothpick inserted into the center comes out clean. Cool the cakes in their pans for 10 minutes before removing them to cool completely on a wire rack. Baked cake with dots Inside look a little crazy. Beat until smooth. Add more liquid or sugar until it is the right consistency. Spread the frosting on the cake, being careful not to get crumbs into the frosting. See the tips below. 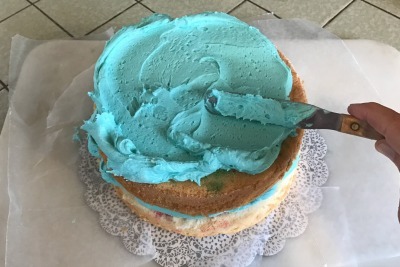 Decorating a cake with frosting is a creative endeavor. Some people struggle to frost a cake without it falling apart, having the cake show through, or having frosting full of crumbs. 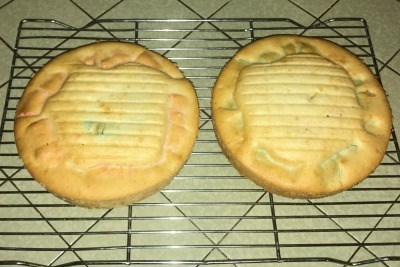 I have made some pretty ugly cakes myself. The key is to no compromise on any of these items. Start with a firm cake recipe. Homemade cakes are actually firmer than box mixes but if you want to use a mix, you should be fine. I did. If you find your mix makes a weak cake, try another brand. Use cake pans that are the same size, with straight sides. They shouldn’t slant like the ones you see in the grocery store. To prepare my cake pan, I spray it with cooking oil spray. Then dust with flour. Then cut out round pieces of waxed paper the shape of the bottom of the pan. That goes over the spray and flour. This ensures your cake won’t stick. Freeze your cakes. This will make them easier to handle. Don’t worry, no one will be able to tell if you freeze them in air tight, heavy freezer bags. Make the frosting creamy enough to spread easily. It should be softer than peanut butter but firmer than whipped cream. That way it will spread without tearing the cake but will not fall off either. Make enough frosting to put a thick layer on the cake. If you aren’t sure, just make more but make it all at the same time if you are adding color. Otherwise, you won’t be able to match the color later. You can always use the extra frosting on gram crackers for snacks. With a sharp knife carefully cut the domed surface of the cakes so that they are completely flat. You can nibble on the cut off pieces to keep your stamina up. Prepare your cake plate by placing thin strips (about 3 inches wide) of waxed paper around the edges of the plate. That way when you are done and you remove the waxed paper, your plate will be clean. 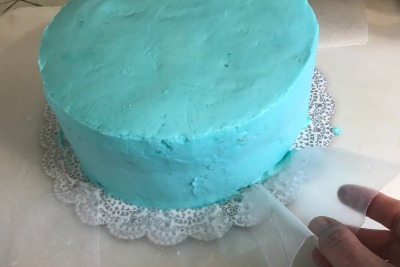 Here you can see I am removing the waxed paper after the cake is frosted. Place the first cake on the plate with the cut side down. That way when you frost it fewer crumbs will get into your frosting. Once the first layer has frosting on it, place the second layer over it, with the cut side down. That leaves a nice square, crumb free top to work with. Use lots of frosting as you go. Push the frosting over the cake. Never let the knife touch the cake. It should only touch frosting. If you do get crumbs on the knife, clean it off with a wet towel before moving forward. For a very important party, practice this whole process ahead of time. No one will mind there is an extra cake in the house. Push a lot of frosting around with your knife. 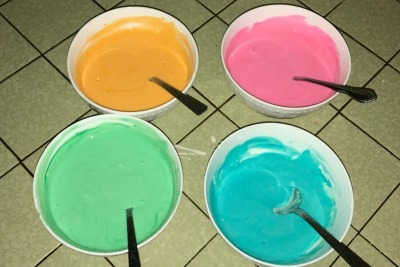 Make a half batch of white frosting and divide it into as many bowls as you want colors. Add color to each bowl. I used yellow, pink, orange and green. Put the frosting into pastry bags fitted with frosting tips. I used simple round tips #6 and #8, but any round tip will work. A good cake decorating set doesn’t cost much and will last forever. 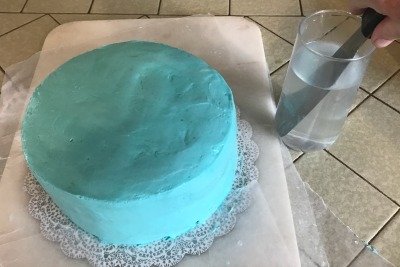 Start by adding a border to the top edges and bottom edges of the cake. I did a large round dot of green frosting. 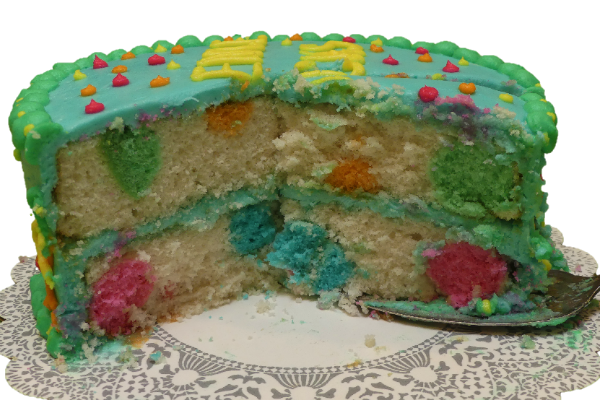 Then draw atoms on the side of the cake and add little dots all around of different colors. Touch the top of each dot with your finger to make it round rather than pointed. For the top, write your message and then add decorative dots to finish your decorations. Feel free to practice on a piece of waxed paper. Just wipe the frosting off the paper and reuse until you feel good about your progress, then you are ready to frost your cake. I used disposable cake decorating bags. Washable ones are good too. I don’t recommend just using a plastic bag. They break. To make the frosting finish flat and smooth, I dip a metal spatula into a glass of hot water. Then touch the tip on a towel to get the drip of water off. It doesn’t have to be dry. Then smooth the frosting with the hot knife. Write your words out on a paper and figure out which letters are the middle. Then write your message from the middle out to make sure it will fit and be centered. When holding the pastry bag, be sure to twist the end tightly, so that frosting doesn’t come out the wrong direction. If you are teaching children how to decorate cakes, but less frosting in the bag to make it more manageable and use large tips. We hope you have fun making the cake and of course sharing and eating it with your party guests!